The 402 students who will be honored at this year’s EOP Honors Convocation have one thing in common: they were not expected to be able to succeed in college. “And yet here we are, celebrating their academic achievement,” said Yanick Jenkins, director of Buffalo State’s Educational Opportunity Program. 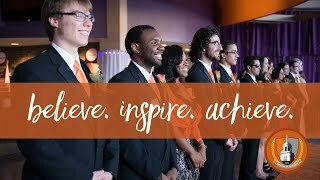 Buffalo State’s 45th annual Arthur O. Eve Educational Opportunity Program Honors Convocation recognizes EOP students who achieved a 3.0 GPA during the spring or fall 2011 semester as well as students who have a cumulative 3.0 GPA now. Cherie S. Laury, class of 2014, is a business major. She will receive the 2012 Martha Pierce Student Recognition Award. This award recognizes a nontraditional student who has succeeded as an outstanding student despite difficult circumstances. Cody Levy, class of 2013, is an art major. He will receive the Annie Joe Memorial Scholarship, which honors a student in the EOP program who continues to succeed while overcoming life’s obstacles. Lori L. Till, associate professor of hospitality and tourism, will receive the EOP Faculty Merit Award. The theme for this year’s convocation is “Imagine, Believe, Achieve: Celebrating 45 Years of Intellectual and Creative Achievement.” In honor of the Year of the Arts, James Huggins, class of 2012, will present a dance performance. David Rodriguez, ’95, is this year’s EOP Distinguished Alumnus. After graduation, he went on to the University at Buffalo Law School where he earned a J.D. He is now the general counsel for the Buffalo Municipal Housing Authority. “The retention rate of EOP students is among the highest for first-year students,” said Jenkins. “Our graduation rates have risen, too. We are very proud of these achievements.” A record number of students were inducted into the EOP Chi Alpha Epsilon Honor Society this year. To be eligible, students must maintain a minimum 3.0 GPA for two consecutive semesters. Crystal D. Peoples-Stokes, ’74, ’02, New York State assembly member, will present closing remarks. 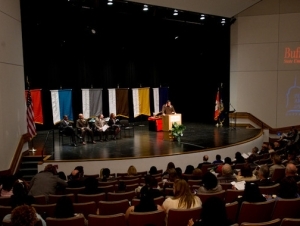 The campus community is invited to attend the EOP Honors Convocation, which will be held on Thursday, May 3, at 3:30 p.m. in the Rockwell Hall Auditorium.